One of a kind ocean front home with two bedroom, one bath on Cape Cod. This Property is the fully renovated top floor of Historic Monument Beach Train Station. Beautiful Ocean Views from every room of Phinney’s Harbor and Cape Cod Canal. This lovely home is beautifully furnished with new furniture and has one queen, 2 bunks, and a pull-out bed. The property can sleep 5 easily and has a flat screen t.v./ dvd and internet. 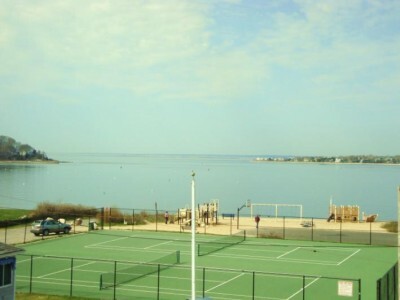 Steps to private & public beach, tennis & basketball courts, playground, and marina. Plenty of parking and large deck with grill. Located in Village square with restaurants, markets, post office, kayak rentals, and lots more. Great area for shell fishing and has some of the best seafood restaurants on Cape Cod that are located within minutes. Eat-in Kitchen with Island, microwave,stove,coffee maker,dining area, living room,two bedroom, and large deck with grilling area. Tennis, golfing, marina, kayaking, sailing, biking, basketball court, playground, and conservation park with great bird watching area, all steps away. 1200.00 a week with a 300$ deposit. Long term and month long deals. May 1 through summer and off-season.